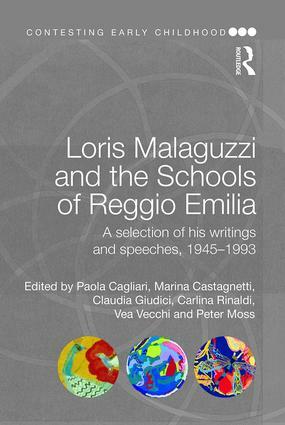 Loris Malaguzzi was one of the　most important figures in 20th　century early childhood education, achieving world-wide recognition for his educational ideas and his role in the creation of municipal schools for young children in the Italian city of Reggio Emilia, the most successful example ever of progressive, democratic and public education. Despite Malaguzzi’s reputation, very little of what he wrote or said about early childhood education has been available in English. This book helps fill the gap,　presenting for the first time in English,　writings and speeches spanning 1945 to 1993, selected by a group of his colleagues from an archive established in Reggio Emilia. They range from short poems, letters and newspaper articles to extended pieces about Malaguzzi’s early life, the origins of the municipal schools and his ideas about children, pedagogy and schools. This material is organised into five chronological chapters, starting at the end of World War Two and ending just before his death, with introductions to each chapter providing background, including the historical context, the main events in Malaguzzi’s life and the rationale for the selection of documents. The book　provides　a unique insight into the background, thinking and work of Malaguzzi,　revealing, in his own words, how his thinking developed, how he moved between theory and practice, how he border-crossed many disciplines and subjects, and how he combined many roles ranging from administrator and campaigner to researcher and pedagogue. Academics, students and practitioners alike will find this landmark publication provides rich insights into his life and work.